Tuesday, April 30th, 2019 @5:00 am, King Power Stadium, Leicester. 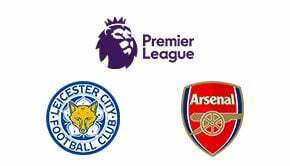 Arsenal’s stuttering away form will be severely tested as Leicester City’s stars aim to show Brendan Rodgers they are worthy of being part of the squad for next season. Monday, April 29th, 2019 @1:30 am, Old Trafford, Manchester. The race for Champions League qualification is still very much on – and these two sides are both in with a chance of a top four finish. Sunday, April 28th, 2019 @11:05 pm, Turf Moor, Burnley. Manchester City look to keep the pressure on Liverpool at the top of the table - and pick up three points from their trip to Turf Moor. Saturday, April 27th, 2019 @5:00 am, Anfield, Liverpool. Liverpool welcome Huddersfield to Anfield on Friday night for their week 36 Premier League tie. Wednesday, April 24, 2019, 4:45:00 AM. Tottenham look to consolidate their Champions League qualification spot with a win over Chris Hughton’s struggling Brighton.